This the first thing I saw on my way to work yesterday, and every day from now on. So out of place. For the last two years, we knew it was coming. It just was put off for so long it still came as a shock to see the work begin on this historic building at the corner of Broughton and Jefferson Streets. Yesterday as I walked from the parking garage to work, my eyes were immediately drawn to the garish red and yellow sign pictured above. It is jarring against the historic landscape of Broughton Street. I can’t be the only one who is surprised that there wasn’t more of a fight to prevent this from happening at all, but even more disappointing right now is the simple fact that this sign was allowed. It really just is a distracting eyesore. It’s highly unfortunate that they couldn’t arrange a different location for this. 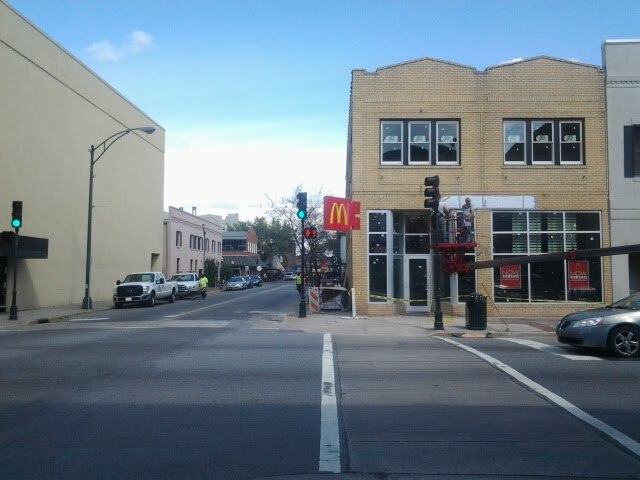 Although there are a few chain restaurants in operation on Broughton St., the loud presence of McDonald’s just cheapens the scenery. They are going to have a walk-up window on the Jefferson side of the building, and it will be interesting to see how it affects the foot traffic at certain hours, say when the bars let out, if they plan to stay open that late. I feel like allowing this caliber of fast food business into the historic downtown just starts a slippery slope of what’s next. Dollar Store? Burger King? My main issue is that if the city of Savannah made it easier for small businesses to start up and thrive then this building could have gone to a local merchant. There are so many vacant and unused properties in this city, the wasted potential is maddening. Here was an opportunity to kickstart a new local venture, but instead the city chose to go with fast, cheap and easy. If that mentality sticks around, it won’t be long before the whole downtown is seen that way. Let’s hope it doesn’t ever get to that point and fight harder against similar situations in the future . What makes Savannah unique-or any interesting locale, for that matter- is not the familiarity of commonplace chain stores and restaurants, but rather the things that stand out and make it unequivocally feel like Savannah. The sense of place experienced in a stunning historic city like this is not something that should go down without a fight.